World's First Cloud-based software and CRM. Your team, clients and affiliates have instant access from any internet device anywhere in the world (PC, Mac, Tablet or Smartphone). 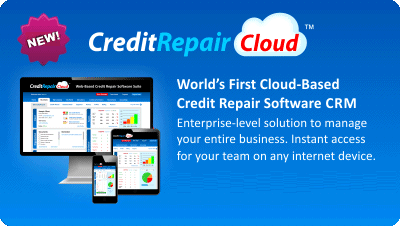 Credit Repair Cloud has it's own built-in Client and Affiliate Portal. Includes all Pro Bonus add-ons. This is the most advanced Credit Repair Business system on the planet. Try it free for 30 days -- Click Here! All Credit-Aid Pro Software customers receive a coupon code good for 2 free months of Web Hosting, A legal library with 100+ dispute letters, power of attorney, contracts, etc., plus website templates, marketing materials and more to jump-start your business. 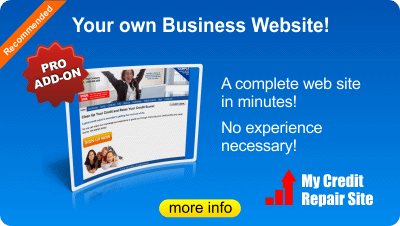 Need a professional website for your Credit Repair Business? Get one today (no experience necessary) at www.mycreditrepairsite.com. Pricing: Complete site and hosting is $19.95/month. Offer: Be a paid Credit Repair Cloud user and get a coupon code for 2 months free hosting. Apply coupon code during web hosting signup. 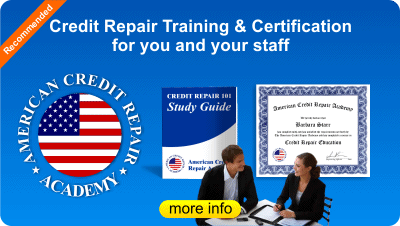 For training for you and your staff we recommed the American Credit Repair Academy. If you’re serious about Credit Repair as a business, sign up for the Credit Repair 101 Training and certificate. Generic/No-brand Home-User Software has NO Credit-Aid Branding and none of our company information. Buy licenses wholesale in lots of 100 and resell for any price you like. (for unlimited profit potential). The Automated Web Store: Sells your software, accepts credit cards (paid to you), delivers instant downloads to your customers. If you've ever bought a product from us in the past we will always take care of you in the future with generous discounts and upgrades to new products and services. Your successful business is our goal. "I earn more in Credit Repair than I ever did as a Mortgage Broker...and I work fewer hours!" ©2002-2012 Credit-Aid Software. All rights reserved. Reproduction, adaptation, or translation of this document without prior written permission is prohibited and is protected under the copyright laws. Credit-Aid Software is a registered trademark. All other trademarks are the property of their respective owners. Windows® is a registered trademark of Microsoft Corporation in the United States and other countries. Credit-Aid Software is licensed to install on one (1) computer. All sales are final unless otherwise stated in terms and conditions. Credit-Aid Software's intended use is to help automate the process of cleaning up your credit history reports. Credit-Aid Software is not sold in the State of Louisiana. Credit-Aid Software gives Credit Information, not legal advice. For questions about specific issues regarding your credit, please consult an attorney. If your credit score does not improve in 90 days we will refund 100% of your purchase price (including shipping). To receive this refund, please provide us with your order number, receipt of purchase, plus credit reports and scores from all three bureaus (dated before and after 90 days). Our 30 Day Product Guarantee We believe in our products and we know you will love them, too. Our software support team is available to assist you and will generally reply to any concern within 24 hours. If, however, they are unable to resolve your technical issues we will offer a full refund, within 30 days of purchase. In the unlikely event that you experience any difficulties whatsoever with Credit Aid, our support team wants to hear from you. The software has been triple quality assurance checked at every level. It is being used and enjoyed by thousands of happy customers. We are confident that it is stable and will function trouble free on any computer running Windows 8, 7, Vista or XP. Buy with Confidence! Refunds are based on Software failure, not general dissatisfaction or lack of features. Please note that Credit-Aid Software’s Titles are available on a try-before-buy basis as “Free Demo” versions. We clearly post links to "free demos" and "video tour" on nearly every page of our web site because we encourage all users to download and evaluate all software before purchase. Refunds are provided only after our technical support team has assisted in your installation and the Software fails to function fully according to the technical team diagnosis. We will determine if a refund is necessary based on individual situations. Refunds are not available after 30 days from purchase date. *Credit-Aid Software is "designed for Windows 8, 7, Vista or XP." This information is displayed on the top of every page in our site. Credit-Aid will not run on a any other operating system -- including MAC (unless you are running Windows 8, 7, Vista or XP on an emulator program). Q: How does Credit-Aid software work? Q: Is credit repair difficult? A: Credit repair is simple with our software. It creates all the dispute letters. It makes credit repair as simple as clicking your mouse and it guides you the whole way. Please watch the 4 minute video tour to see just how simple it is. Q: How long will it take to fix my credit and what results can I expect? A: That depends upon your credit. Everyone's situation is different. Most people see positive results within 30 days. Q: How many points can credit be raised by using your software? A: That all depends upon your credit situation and everyone's is different. Most credit reports contain errors. Errors are easiest to remove. Accurate negative items can often be removed, as well, but they take a bit more finesse. Our software gives you all the tools you need to handle the process and it is a tremendous time saver. Most people see positive results within 30 days. Q: Do you make any guarantees that my score will be raised any certain amount? A: No, we cannot guarantee any certin number of points your score will increase. However, we're sure that your score will indeed increase. We've seen people raise their score as much as 287 points in 30 days. Most people see positive results within 30 days. Here is our 90 day guarantee for home users: If you follow our steps and your credit score does not increase in 90 days, we will refund 100% of the cost of your software. Q: Are there ongoing (or monthly) fees? A: This is “end user” software to install on your computer and not a web based subscription service. There are no monthly or ongoing fees on our credit repair software. Q: Do free credit reports or credit scores come included with your software? A: Credit reports and credit scores do not come with our software but we do provide you the ability to order them easily with a mouse clicks from within our software.You're entitled to free credit reports once a year. Credit scores however, usually must be purchased. We do provide links for easy to access credit scores, but please understand that we have no affiliation with the credit bureaus. Any transaction you make with a bureau or a credit report service is between you and them. We simply provide the link to their site or to print a letter. Our software is for automating the dispute letter process. That's what we do and we do it extremely well. We are not in the credit report business. Q: Can you give me advice about my own credit? A: We are not allowed to give advice about specific credit issues, however we offer plenty of information in our software and in our credit repair blog. If you have general questions about running the software. Please visit this page for a support form. It will be received by a technician who can help you. Make sure to use the email address you used when making your original purchase and include any relevant details. Q: Do I need a license to start a credit repair business? A: A license is generally not required to repair a clients credit. However, laws can vary from state to state. Click here for more information on credit law by state. Q: What are your recommended products for starting a credit repair business? Q: What is the difference between basic pro and turn-key packages? A: We no longer sell Basic Pro. All of our pro packages are identical. The only different is number of available client slots. The "turn-key" solutions have everything you need to start a credit repair business, including client contracts, power of attorney and many other necessary documents and additional letters. Q: What additional materials come with the larger Corporate Pro (turn-key) credit repair business versions? A: Our Corporate Pro (turn-key) solutions handle far more clients at a much lower cost-per-client. They include paperwork required to start a credit repair business (i.e., power of attorney authorization, consumer credit file rights, client contract agreement, plus additional credit repair letters and more). These packages are a much better value and will pay for itself with the first few clients. After that it is all profit. Q: I want to use this for clients. Can I just buy the cheaper home version and copy the letters? A: Our "home-user" version is not useful to professionals. "Home-user" versions only 3 members. You cannot add more names, you cannot delete them. You also cannot copy or reuse the letters (copying and pasting will not work). There is no way to track your clients. You will have no product updates, professional materials or support. "Home-user" versions are only for home-users. Q: Can I speak to a real person for more information? A: To contact a product specialist for a free consultation (or to hear about our current specials), please call toll-free 800-257-1192. You can also contact us here. Q: How do I contact Technical Support or customer service? Q: What is the difference between your home-user and your professional software? A: Our home-use software is limited and only suitable for a home user. The professional versions can handle multiple clients. Our turnkey credit repair packages have everything needed to start a credit repair business; advanced features, additional letters, support, and bonus materials that include client contract, rate sheet and power of attorney. For more information about pro software, please click here to visit the PRO page and click on any of the product buttons. You can also call for a free consultation: toll-free at 800-257-1192. Q: What makes your software better than others? A: Our people! We have fantastic customer service and support (and we are really nice). To be honest, we do not pay attention to other company’s products. We are too busy selling our own and insuring customer satisfaction. We are the one seller of consumer and professional credit repair software in America. Q: What happens when I fill up the available client folders/slots? Can I delete clients? Will I have to buy a whole new version? A: When you have used up all of your available client slots you will need to buy a new version. Clients cannot be deleted. However you will have two options, a repeat customer discount -- or you can buy a 2X special, which gives you a 2nd copy (at the time of the original purchase) for 80% off. To inquire about our specials, please call for a free consultation at 800-257-1192. Q: Can I buy a smaller version and upgrade later? A: When We dont have upgrades, because one product does not replace another...however when it's full you could buy another, and we always give discounts to repeat customers. If you are starting a credit-repair-business you will need a turnkey product. It has everything you need and it will more than pay for itself with the first few clients. Q: Can this software be run over a network? A: No, this is end-user software to install and run on only one (1) PC. It is not networkable. All of your important sensitive client data is safely encrypted on your own computer and not saved on a server where it can be accessed by anyone else. It you need it for more than one PC (a second computer or laptop), please contact us about purchasing additional licenses. We always give discounts to existing customers. Call Toll free 800-257-1192 or click here to visit our contact page. Q: Can I install on more than one computer (multiple computers)? A: No, our software is sold as a single license and can only be installed on one computer hard drive. If you wish to install it on a second computer or laptop, please contact our sales department for an additional license at a discounted rate: Call Toll free 800-257-1192 or click here to visit our contact page. Q: Will this software allow me to do the disputes online? A: No, and it often works against you if you to dispute on line. You have greater success if by paper mail. It's more time-consuming for bureaus to process and if they do not reply within the allotted 30 days (according to the Fair Credit Reporting Act) by must remove the disputed item from your report. Q: Will this software work on a Mac? A: Credit-Aid is written for Windows 8, 7, XP and Vista. If you have a Mac and are running Windows XP or Vista, then you should be able to run it. However, we do not support Macs. Please download the free trial demo to see if that will run on your Mac. Q: Do you have software in Spanish? A: Si! All of our software is available in Spanish. Please click here for our site in Spanish. Q: Will the credit bureaus accept letters written in Spanish? A: Yes, the bureaus are bi-lingual and must accept letters written in Spanish. Q: Do you have sales/support people who speak Spanish? A: Si! To speak with a representative in Spanish please call toll-free 1-800-257-1192. Q: Why don't my credit reports have "scores"? A: Most Credit Reports ordered by consumers do NOT have credit "Scores." -- especially those ordered for FREE from the Annual Service, The scores are generally sold at a premium. Here is our recommended source if you are seeking actual credit "scores"
Q: My credit report does not contain Spouse information. Should it? Should I include Spouse information when requesting or disputing a report? A: (Copied from EXPERIAN.COM) "The credit reporting agencies maintain individual credit files for each U.S. resident. They do not maintain combined files for spouses. Therefore, your credit report is separate and different from your spouse's. Joint credit accounts you have with your spouse will appear on both credit reports." Because the bureaus maintain individual credit files for each US resident, it is easiest when communicating to the Credit Bureaus communicate as individuals, rather than trying to combine communications and disputes. When using Credit-Aid Software, it is advisable to create completely separate user profiles and completely separate request and dispute letters, rather than trying to copy and paste between spouses. Q: I have a desktop, a laptop, and several other computers in my office. Can I install this software on more than one computer? A: No. Credit-Aid software is sold with a single Computer license, very much like Windows or Office or many other popular programs. It may not be installed on more than one (1) computer. If you would like information about purchasing a multiple user license, click here for more information and pricing. Q: When I start to install Credit-Aid software, I am getting a message window that says "Unknown Publisher." What does that mean and what should I do? A: We are not affiliated with Microsoft in any way, therefore we will always be an "Unknown Publisher." This is just part of WIndows security letting you know that our software has not been verified by Microsoft. When you seen "Unknown Publisher" simply continue the install process. Q: Help! I can't download my Credit Reports from the Credit Bureau web site! A: We don’t have upgrades, because one product does not replace another...however when it's full you could buy another, and we always give discounts to repeat customers. If you are starting a credit-repair-business you will be much happier and more productive with a turnkey product, plus the larger versions cost less per-client We understand that the credit bureau websites can sometimes be "unfriendly." We have no affiliation to the credit bureaus. Our software does provide an easy link to connect you directly to their websites where you can order reports, but once you are in their websites we cannot control how they respond to you. The main function of our software is to generate the letters needed for disputing items in your reports, submitting them “in writing” to the bureaus, keeping track of your progress, and keeping it all organized. Viewing your credit reports on the credit bureaus web sites is completely dependent upon your own computer’s settings and your ability to provide the information that they request. We recommend using our software to create the report requests “in writing” so that you can create a paper trial. It takes the bureaus longer to items submitted in writing, which can often work in your favor. By law, we cannot go any further than that in offering specific credit advice, but for more information about the Credit Repair Process, please download our free booklet at www.credit-aid.com/booklet-form.htm. Incidentally, while we are on the subject of credit reports: most Credit Reports ordered by consumers do NOT have credit "Scores." -- especially those ordered for FREE from the Annual Service, The scores are generally sold at a premium. 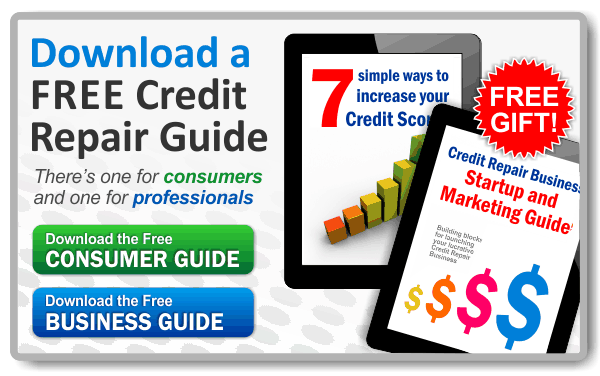 Here below is an alternative source if you are seeking an actual credit "score". Q: Why is this software so reasonably priced? A: We believe that software should be affordable. We also truly want to help people. We know that we have created the best credit repair software on the market and we also know that if you have success, you might tell a friend about it, and if enough people have success, we will sell plenty of programs, and help a lot of people, and everyone wins in the end. Q: I do not have Windows 8, 7, Vista or XP. Will Credit Doctor run on older versions of Windows? A: No. Credit Doctor will only run properly on Windows 8, 7, Vista and XP. Q: Do you have a Canadian Version? A: Although we've traveled everywhere from Moose Jaw to Medecine Hat, we are American and live in California and we have no knowledge of the Canadian Credit Laws. A Canadian version my be in the works soon, but for the moment, it takes all the hours in the day to improve our own American version. If you are Canadian and need help with Canadian Credit Repair information click here. Q: I am a Mortgage Broker and I want to be able to help my clients with their credit. Do I need a special license for this? A: If the dispute letters come from your clients, are signed by your clients, and if you are not charging them for this service, then your clients are repairing their own credit. You would simply be helping them to repair their own credit by using our software to generate the letters, track their progress and keep them organized. Another option is to have your clients sign a Power of Attorney letter to allow you to do this work on their behalf. The Power of Attorney letter is included in our larger professional versions. Please consult with an attorney in your specific state to confirm this. As far as charging your clients for this service, we believe that if you go the extra mile for your clients, you will receive back more rewards (by way of closed loans, goodwill and word of mouth) than any small fee you might charge for printing and sending a few letters. Q: I have paid for Credit Doctor and received my Activation Code from you, but when I try to enter my activation code into the program, it just says DEMO DEMO and I can't enter in the code. A: If it says DEMO DEMO, that is NOT the Credit-Aid Full Version program. What you have is only the free Demo, and you must completely uninstall the demo prior to installing and running the full-version. Q: I am trying to install by typing in the name and activation code you sent me, but I keep getting an error message that says "Invalid User String." What do I do? A:"Invalid User String" means you are entering an incorrect name and code. This usually occurs when trying to "retype" the name and code we sent. Please try to "copy and paste" the name and code (instead of retyping) and you should have success. FYI: To cut and paste: Use Control + C to COPY and Control + V (Or Right Mouse Click + Paste) to PASTE it into the Activation window. Q: I was sent a shipping confirmation email from Google Checkout or PayPal. Where is my download? *Credit-Aid is an automated "INSTANT DOWNLOAD", but your download info will not display (and send) until YOUR bank has approved your purchase. This generally happens in approval. If you purchase through Paypal, you can log into your PayPal account at http://www.PayPal.com to see your order status. If you have purchased through Google please log into your Google Account at http://checkout.google.com to see your order’s status. If you purchase directly with a credit card, you will receive email notification when the order has processed, along with your download and activation info. If you have any trouble, please send us a friendly email and we will be happy to help you. Q: Why does Google send me shipping confirmation with my mailing address when I have only purchased a download? A: This is a quirk in the Google Checkout system. If you purchased a download, you will only receive a download. If you paid an extra fee to purchase a backup CD/Shipped one will be shipped to you. Q: I bought a copy of Credit-Aid, but my computer crashed. How can I get a new copy? A: No problem! We will be happy to help you (up to one year from your original purchase), but to do this we must be able to find you in our system, so please send us an email with the name and email address used during your Credit Aid purchase (and an order number so we can look up your order information) . If you have used Google's email masking when placing your order, this could make it more difficult for us, so the more info you can provide, the better. We will be unable to regenerate and resend your download if more than one year has passed since your purchase. Q: How do you handle product returns? Q: I am trying to download this program, but I keep getting corrupt or NCIS error messages when trying to install it. What is wrong? A :"corrupt" or "NCIS" error you are getting means that you are not downloading the entire program. The install file is 13.2 Megabytes. It will not install unless you download the entire file. 2/27/2008 We are now sending all downloads in the form of ZIP files. We now do this because Norton and other Antivirus products prevent downloads of exe setup files. If you have downloaded the entire zip file, it will open if you choose OPEN or RUN and inside the ZIP file is the Credit-Aid setup file. Doubleclick on the Credit-Aid setup file and in a few seconds the installer will start. Make sure you follow the defaults and DO NOT TRY TO CHANGE THE LOCATION WHERE CREDIT-AID WANTS TO INSTALL! If you are double clicking on the file you have downloaded and nothing happens, or you get an error message that Windows doesn't know what to do with it, you probably haven't downloaded the entire file. Download the file again and remember to save it to your desktop. Make sure you have the full 13.2 megabytes. Once it has downloaded, you can check the file size by doing a right mouse click on the file itself and choosing PROPERTIES (with the left mouse button). If you have downloaded the entire file it should install perfectly. If for any reason this does not work, please send us a friendly email to contact our support team with detail of the problem you are having, along with your order number (and the email you used during purchase and we will be happy to help you further. We want to help you. Q: I didn'treceive my activation letter...or my time ran out. Can you resend my download and activation information? Activation letters are sent IMMEDIATELY when your credit card is charged. Our system is automated. If you did not receive your activation letter, first please look in your SPAM or BULK email folder. That's where they sometimes end up, because spam filters also can filter out important mail. If you do not see your activation letter in your SPAM or BULK email folders, please do not call our sales staff. They are in a separate location and they cannot help with technical matters. Contact our support team and we will be happy to help you very quickly, however, before you do, please read the following so we can help you. The EXACT email address used during the ORIGINAL purchase. Please note that our system will only resend to the EXACT email address used during the original purchase. No exceptions. **Please note that your software is licensed to use on only one (1) computer. We monitor how many times it's been downloaded, and if you've attempted to install it on more than one (1) machine. If you would like to install it on more than one computer, please contact us about purchasing additional copies at discount (ie; multi-user licensing). Q: If I am a Mortgage, Real Estate or Credit Professional, can I just buy the consumer software? Will the consumer version be useful for me? We offer "limited feature / limited use" versions of our software to "consumers" at a consumer-level price. These versions are not useful for professionals. Our professional software is affordable for any size office or budget you have.Our largest version, PRO-1000 will help 1000 of your clients to improve their credit scores for less than $1 per client. If you help one client to raise their score and close a loan, the professional software will have already paid for itself many times over. Plus, the good will you've generated by "going the extra mile" for that client will pay you back many times over in referrals. If you have questions about our PRO software, you may also call our Corporate Sales Desk at (800) 257-1192. Would you like to earn revenue from your website? Do you have clients, website, e-zine, blog or newsletter viewers? who can benefit from Credit-Aid Software? Earn revenue as a Credit-Aid Affiliate.